I am so grateful to have ended my search with Dr. Schumacher and all his staff......Not only is he so knowledgeable but also super kind to his clients and staff. They have been like family to me, and they have gone beyond their roles to make me feel comfortable and relaxed. I got pregnant pretty much when I started, I attended appointments with my baby, they have watched him grow and have taken care of him while I was being seen. They are great!!! I had a very challenging case, I am in the retainer stage now and can not believe my eyes on the progress accomplished !!!! This is a wonderful orthodontics office. Dr. Schumacher is a great doctor and so friendly and professional. The office staff and techs are amazing and my daughter actually enjoys going there. Besides doing great work on my daughters teeth, they have a great rewards program that promotes good grades, service to community and awards. Also, the end of year party is a blast. Don't hesitate to go here. I'll actually miss the folks there when we are done! My daughter has several friends that have braces already, so I was able to receive numerous recommendations to orthodontists in the area. All of the recommendations I received for Dr. Schumacher were far and away the most enthusiastic, so we scheduled an evaluation appointment, and I was absolutely blown away by the experience. Dr. Schumacher is extremely friendly, took the time to get to know my daughter and helped her to understand that she has to be committed to the process. I love his office, and he has an absolutely wonderful staff. We are greatly looking forward to the next 3 years with Dr. Schumacher, and I'm sure my youngest daughter will become a patient of his as well! Wonderful doctor and staff. Very attentive and personable. I highly recommend this office. Dr. Schumacher is the best Orthodontist . He helped me stop my gagging problems when i took the mold of my teeth.i love all the nurses they are so nice and caring. His office is kid friendly it has a tiki token program and an x box for kids to play on when they wait. Dr. Schumacher has changed my life though changing my smile. He and his staff have given me personalized treatment over the course of the past year and a half that has exceeded all expectations. 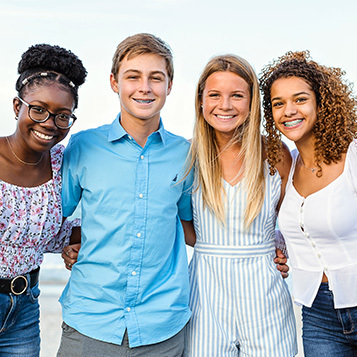 Always giving great attention to detail, thoroughly answering all questions, and addressing all concerns, you could not ask or hope for a better orthodontist then Dr. Schumacher. We love Schumacher Orthodontics!! My daughter is about halfway through her two year treatment plan. The atmosphere is so fun for the kids and comfy for parents. Dr. Schumacher & his staff are highly competent and a pleasure to interact with. There is never a long wait to be seen. I have zero complaints and can't think of a suggestion to improve anything there. We give them 5 stars! !